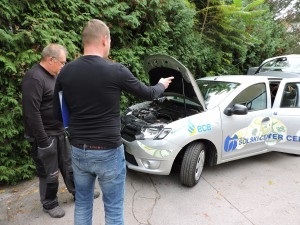 High school students from Celje encouraged people to start using green mobility. Fossil fuels are polluting environment and are limited in quantity. 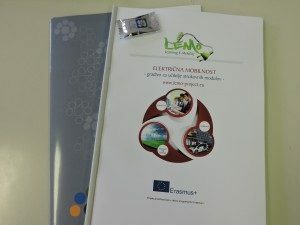 This is the reason that students from high school for logistics and services in Celje took active role at participating in Erasmus+ project Lemo – Learning E-MObility. The goal of two years long project is to encourage individuals to start using green technology in everyday life and to decrease harmful influences to the environment. Speakers at the workshop talked about the ideas on how to increase awareness of sustainable mobility between youngsters and students. They were discussing on the topic: future of electric vehicles in Slovenia and compared it to the evolution of sustainable mobility in Finland where students are currently on a week long exchange. Teachers and students used this occasion to introduce new study material on the topic of e-mobility. This learning matter is an important step towards the curriculum update in the transportation and logistics field. Learning material was created as the end product of the collaboration between schools and it was improved by the help of experts from sustainable mobility field. Participants of the workshop were able to test drive an electric car, learn the benefits of electric mobility and try to plug an electric car in the charging station.